In the aftermath of hurricane Katrina, many of us are wishing that we had some sort of control over the weather. Science fiction writer John Varley even thought about how we might become weather artists in his 1976 novel The Phantom of Kansas. Remarkably, there are real weather artists who try to make what beauty they can from nature's worst storms. The Kansas disneyland was one of the newer ones, and one of the largest. It is a hollowed-out cylinder twenty kilometers beneath Clavius. It measures two hundred and fifty kilometers in diameter and is five kilometers high. The curvature of the floor is consistent with Old Earth so the horizon is terrifyingly far away. Only the gravity is Lunar. 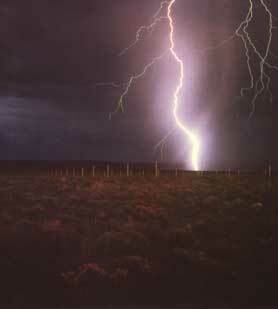 In the mid-nineteen seventies, artist Walter de Maria created The Lightning Field near Quemado, New Mexico. It consisted of 400 stainless steel poles averaging just over twenty feet in height. The overall dimensions were 5,280 x 3,300 feet. Writers sometimes say you should write what you know, advice Varley took to heart with his story. He had a childhood encounter with Hurricane Andrew in Port Arthur, Texas. A category 4 storm, it killed hundreds of people in nearby Louisiana. The earliest science fiction reference I know about for control of the weather is in John Jacob Astor's 1894 novel A Journey in Other Worlds - people use aeriducts to make rain at will; complete control over all weather is also foreseen. Other more modern references include the weather integrators found in Robert Heinlein's 1940 novel Methuselah's Children and the regular showers in the lunar habitats from Arthur C. Clarke's 1955 novel Earthlight. Human beings have, of course, been trying to figure out how to manipulate the weather since the dawn of recorded history. Thanks to Blue Monkey for contributing the tips on this story.